Never throw into a blind area or when players, spectators, pedestrians, or other facility users are within range. Use a spotter. Observe all posted rules. No littering, graffiti, or abuse of equipment or flora. Be positive and responsible. Teach others. There aren’t many words here, but they may hold the key to the sustainable growth of our sport. Our previously exclusive pastime is expanding at a positively viral rate and we are no longer just a few kids fooling around in the park. If we have aspirations to be a significant part of the global (and local) sports scene, it’s time for us to step up and represent our very best. Consider how many disc golf shots are now taken every day. Each one of those flights is a tangible part of building and maintaining a bright future for our game. Our time has come to get serious about having fun. The Disc Golfer's Code - Know It and Throw It! 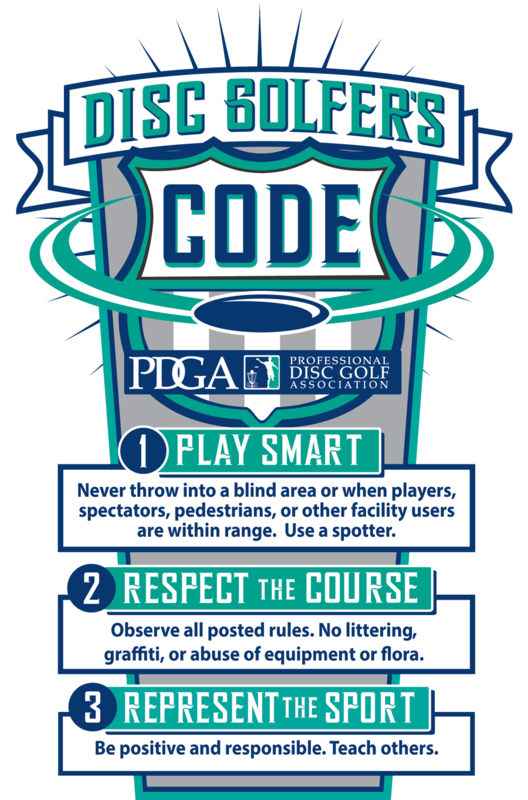 High-resolution versions of the Disc Golfer's Code and the Caution: Flying Discs graphics are now available for download, free of charge!